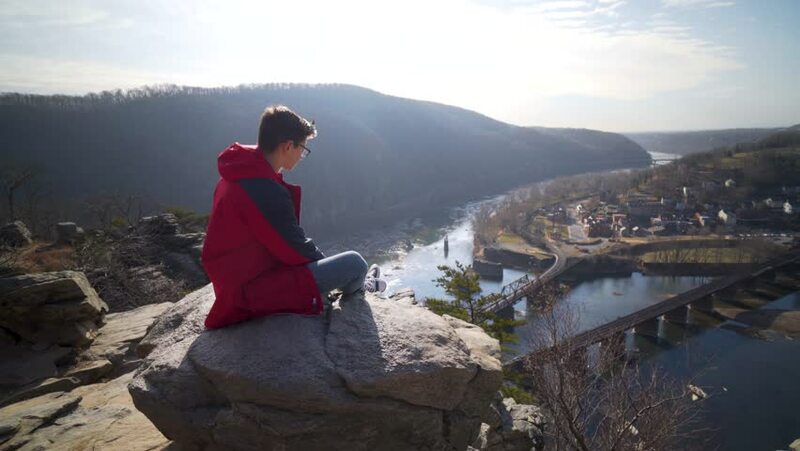 Young man sits on a rock at Maryland Heights while looking at the view of Harpers Ferry National Park and the Potomac and Shenandoah Rivers. hd00:19two beautiful young women in posh black dresses posing together on camera against the background of a mountain landscape. hd00:25A cute little 10 year old Asian girl successfully climbs to the 2nd peak of the Chief in Squamish, BC on a gorgeous summer day. 4k00:07Camera booms down from view of Harpers Ferry National Park to reveal mature blonde mother and son talking at an overlook at Maryland Heights. 4k00:07Mature mother and teenage son talk while sitting on the rocks at an overlook of Harpers Ferry National Park and Shenandoah and Potomac Rivers. 4k00:08Camera booms down from view of Harpers Ferry National Park to reveal mature blonde mother and son talking at an overlook at Maryland Heights. 4k00:17Steadicam gimbal shot of pretty mature blonde woman and teenage son walk across a foot bridge next to a railroad track in Harpers Ferry National Park.